A musical education is essential to every child’s development. Using the Suzuki talent education method in the early stages, I believe along with Dr. Suzuki that all children can learn to play a musical instrument. I work with the parents in my studio to help them establish a musical home environment that will motivate the child to learn. 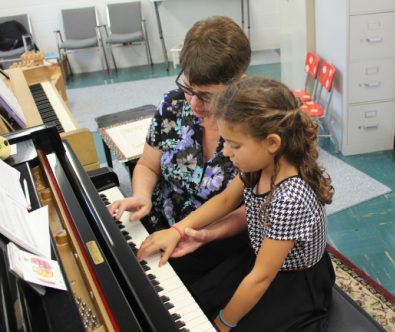 Through parental participation at lessons, the parents are given a model to use at home for practicing with their child to help them succeed at the piano. If parents believe that their child can learn to play piano, I will diligently and patiently work with them to help their child enjoy making music at the piano. For older and adult beginners, I work with them as well to develop the same skills needed to enjoy piano playing. · Establish a relaxed piano technique, good posture and train the ear to listen for a good tone before introducing note reading. · Introduce daily note reading when the child is ready and has a good sense of rhythm and steady beat. · Provide a variety of performance activities to gain confidence to share music with others. A confident performer is eager to play for others. · Use the standard Suzuki repertoire as a basis for learning and when the student is ready, encourage them to pick different types of music to learn that appeals to them as an individual, including jazz, popular and holiday music. · Through the use of Achievement in Music Exams, provide a sequential curriculum for teaching keyboard and music theory skills. · To learn to appreciate all types of keyboard music from the Baroque period to the present day by activities done in group classes, concert attendance and listening. · To provide the student with keyboard skills that will allow them to use the piano as a means of enjoyment and relaxation for their entire lifetime. Heineman Piano Studio is located at 8237 N. Kenton Ave., Skokie, IL 60076. Click here for map.